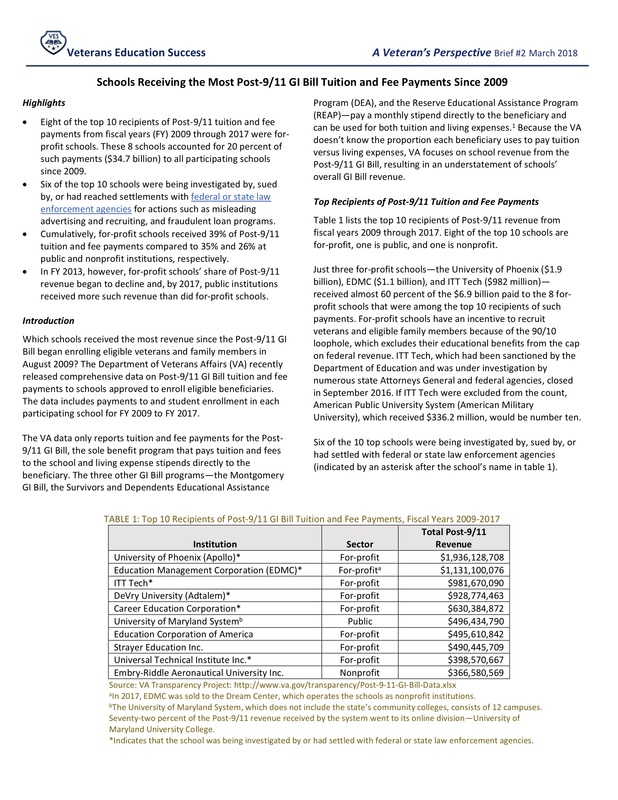 This issue brief focuses on cumulative Post-9/11 payments to schools, not enrollment. Eight of the top 10 recipients of Post-9/11 tuition and fee payments from fiscal years (FY) 2009 through 2017 were for-profit schools. These 8 schools accounted for 20 percent of such payments ($34.7 billion) to all participating schools since 2009. Six of the top 10 schools were being investigated by, sued by, or had reached settlements with federal or state law enforcement agencies for actions such as misleading advertising and recruiting, and fraudulent loan programs.